Everyone is so busy today; it’s hard to find the time to take care of yourself. Brookfield chiropractor, Dr. Nichole Schultz is here to help you manage life’s stresses with caring chiropractic. Our entire team is happy to see you when you come in! At Settimi Chiropractic & Wellness Center our goal is to find the root cause of your pain, rather than simply managing or covering up your symptoms of pain and illness. Your body possesses natural healing abilities that our chiropractic care will help to activate. This enables your body to take care of itself. We love being involved in our local community! Dr. Schultz is available to talk to your group or organization about health at no cost. We love to give back, and can discuss various subjects such as women’s health issues, how to handle stress or wellness lifestyles for your family. We want to share natural, pain-free ways for you to be healthier. We’ll explain how you can develop healthy habits in daily living to bring tremendous change to your life. We’ll give you and your entire family a foundation to build on for a future of wellness. 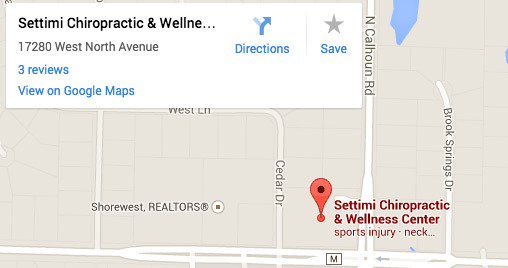 At Settimi Chiropractic & Wellness Center we will provide you with a variety of solutions to meet all your health and wellness needs. Feel taller each time I get adjusted! I have a bad back so it really helps with my back problems. Thanks for seeing me so quickly. Good to be back and hoping to start feeling better with your help. Thanks again! I was very happy with my visit and felt that I finally found someone to help me with my problem. Settimi is very friendly and she built lot of confidence. I am very happy with the attention and treatment I received, after just 2 visits I feel relief of some pain. Timeliness is very important to me.